My daughter is at a friend's house, my son is doing homework, and my husband is listening to the news. I am sitting on the couch planning my reading for the next week or so. I don't usually plan what I am going to read and in what order I will read it but we are going away at the end of the week so that means packing books. This is very serious business. We are going to Chicago for a week. My husband's family lives in Illinois and we used to live out there. We are flying into Chicago, spending a few days with his family and then the second half of the week is fun things with the kids and catching up with some old friends. I don't think I will have much time to read for the second half of the week but the time with my in-laws is usually pretty quiet. They don't have the best health or that much energy which leads to a lot of downtime. Books are essential for distraction and for my mental health. I am definitely bringing the third book in the Lymond Chronicles. I do like to take my time with those though so I want something light and easy to read when I am tired or don't have much time or have too much chaos in the hotel room around me to concentrate on what I am reading. This is where I am not sure what I want. I think a reread. Maybe Angela Thirkell? They are soothing and fun and I have read them multiple times. I am thinking Pomfret Towers might be a good choice. I also want something on my Kindle. I prefer reading real books but Kindles are great for when you are stuck in a hotel room with your family, they are all asleep, and you have insomnia. Then I bless my Kindle and its lighted cover (I have a very old Kindle) and I wonder how I ever survived without it. I don't usually buy books for it, most of the ones I have are the free books that are out of copyright. I just can't convince myself to spend money on ebooks. If I am going to buy a book I want the physical copy. I will probably start either The Song of the Lark by Willa Cather or Armadale by Wilkie Collins. Both are on my Classics Club list. I am hoping to find a few used bookstores while I am in Illinois. I haven't lived there in years so I am sure many of the ones I remember are gone but I will see what I can find. I bought a few books at a thrift store the other day. I went in looking for a summer dress but came out with a stack of books. That is typical of my life. In my defense, the dresses were all ugly and the books were unusually good, very cheap too. I got Travels With Charley by John Steinbeck. I read a review of a Steinbeck novel over at areaderofliterature. I have never read anything by him so thought maybe it was time to start. 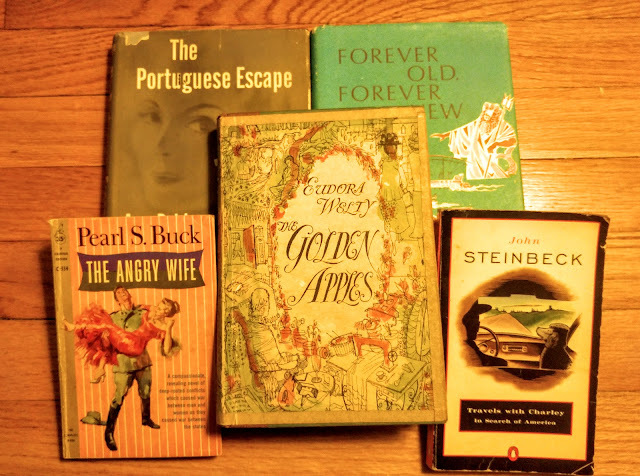 I also got The Angry Wife by Pearl Buck. She is another author I have never read though I do have one of her novels on my shelf already. This caught my eye because I thought her novels were all set in China and this is set in the US right after the Civil War. Besides, that cover! It does not fit the mental image I have of her novels at all which just makes it more intriguing. Continuing the theme of authors I have never read we have The Golden Apples by Eudora Welty. I don't know anything about it, I just liked the dust jacket and was familiar with the name. Next is Forever Old, Forever New by Emily Kimbrough. I love, love, love Our Hearts Were Young and Gay which she wrote with Cornelia Otis Skinner. I know her other books are a bit of a mixed bag but I am hoping it is half as good. Lastly, I bought The Portuguese Escape by Ann Bridge. I have read a few other novels in this series. Julia Probyn is a beautiful journalist who always seems to find the story and unmask the spy--a 1950s spy series, a bit dated but fun. I might take that last purchase with me. The kids have about five million things they want to do in Chicago. We haven't been there in four or five years. We usually meet the in-laws somewhere halfway in between Illinois and Connecticut but they aren't up to the drive this year. Even halfway is ten hours or so. The kids have zoos and aquariums and science museums and restaurants and stores and tons more things on their list. The second half of the trip is mainly for them since we had London in the spring. I think they are going to wear us out. Going back to Illinois is bittersweet. We used to live there, my husband grew up there, so it is home in a way. But at the same time, it is so different after so many years have gone by. It feels familiar and strange all at the same time. I wonder sometimes what our lives would be like if we had never moved east. For one week we will pretend we still live there. My husband's speech will slow down and his mid-west drawl will reappear. We will eat Chicago hot dogs, but without the ketchup, because ketchup on a hot dog is a sin in Chicago. We will cheer for the Cubs because that is what you do even though they never win. We will call every slight incline a hill. I will feel exposed in the flat landscape and my husband will breathe a sigh of relief because he isn't hemmed in by trees anymore. We will merge our past with our present. Why, hello, I missed reading this blog! The job has been crazy busy the past couple of weeks and while I still managed to update my blog weekly, I have truly missed commenting on other blogs and communicating with book bloggers I adore. And what a pleasant surprise to find my own blog mentioned in this post. Serendipitous or what? "In my defense, the dresses were all ugly and the books were unusually good" -- thanks for the laugh! I must admit, I had thought Pearl S. Buck set all her fiction in China as well. You learn something new every day. And that gorgeous cover of The Golden Apples. You weren't kidding when you said "the books were unusually good." Do write reviews when you get around to them. Oh, I hope you enjoy Steinbeck as much as I did. I also hope you have a great trip! I've never been to Chicago, which is tragic. I don't think I've ever told you, but I lived in California for a few years and it's a shame how little I traveled around the USA. Now, there are so many US cities I want to visit. It is nice to hear from you again. I hope work calms down and you get a bit of time to relax. You haven't been to Chicago, I haven't been to California. There are so many places I would like to go but there isn't time or money for them all. I keep telling myself I shouldn't buy any more books but then I find such bargains. How could I leave them on the shelf? I haven't read any of these! I must remedy this soon! It is always fun to find new books to try, isn't it? I´ve read "The Golden Apples" four times. I love the first story (Shower of Gold). The second one is immense and immensely good (June Recital). The third is just a step in the story. The fourth (Moon Lake) was very hard for me to enjoy but the last time I read the book suddenly I saw all the poetry and all the light. "The Whole World Knows" is a little dark and rocky. "Music from Spain" is weird and good. Something like Henry James... the most important is not said. And "The Wanderers" is Heaven. Eudora Welty scream things in silence. I don´t recomend her novels, only her short stories. And "No Place For You, My Love" is... You think nothing is happening, and then it kills you with the delicacy of nothing. A book you have read four times must be good! It is still sitting on my shelf unread but I hope to get to it soon. She loved Austen? Hmmm, that makes her immediately more interesting.